BALFOUR QUALTROUGH, 1899-1975, was the son of EDWARD JAMES QUALTROUGH of Diamond Creek,and ELIZABETH RICHARDS. Uncle Bal was born in Carlton on 6th August 1899, there was a fall of snow that day in the Suburbs of Melbourne. The family resided at Watery Gully Road, Diamond Creek, (Now named Wattle Glen). He attended State School no, 2059, Upper Diamond Creek and was a good scholar, after leaving school at aged 14 years he went to work for Mr and Mrs Lex Brook at Arthurs Creek, he rode his bicycle to work each day. Once he entered a bicycle race at a Sports Meeting at Hurstbridge,had an accident and fractured his collar bone, so, owing to this he was unable to work for some time. Uncle Bal was rather reserved as a child and had a beautiful, kind and loving disposition which he keep throughout his life, he was also a member of the Boy Scouts of Hurstbridge. 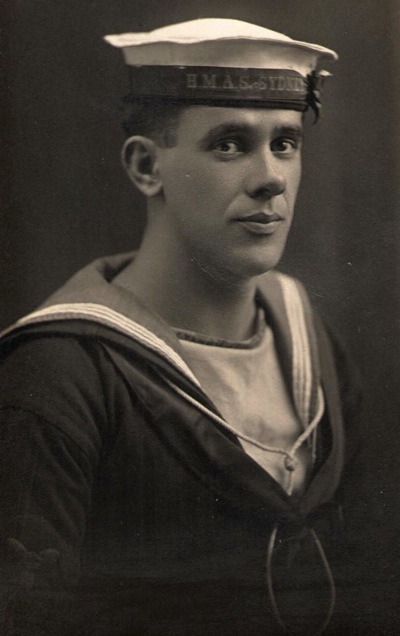 During the latter years of World War 1, 1914-1918, he was anxious to enlist in the Royal Australian Navy, but was too young, he succeeded soon after his 18th Birthday on 20/9/1918 and served until 20/9/1925, (7 years). His personal No was:- 6823. His wartime service was as a member of the Royal Australian Navy. Horace (my dad) and Uncle Bal boarded together, he was also in the Victorian Police Force twice, during this time he had two operations at the Police Hospital in St Kilda Road. He re-enlisted in the Royal Australian Navy on 10/6/1942, his wartime service was as member of the Royal Australian Fleet Reserve from June 1942 to 13/3/1947. He had sea service during the first Navel engagement in H.M.A. Ships, “Australian, Melbourne, Sydney”, for this service he was awarded a War Medal. He also performed duty at the Naval Shore Establishment H.M.A.S. Cerberus, Crib Point, Victoria, as an Ambulance Driver, for this service he was awarded an “Australian Service Medal”. He was also issued with an Ex-Serviceman’s Navel Badge. When World War 2 was over Uncle Bal, still had 7 years to complete in the Royal Australian Navy, he travelled as far as Freemantle, Singapore and Sydney. Uncle Bal was very sad when “H.M.A.S Sydney” was sunk in Sydney Harbour because it was no longer fit for service, this was the first ship he had sailed in. While, on one of these trips to Freemantle he visited cousins over there, the “Pegg Family”. (Catherine Richards, M, George Pegg, of Diamond Creek), and Elizabeth (her sister) M, my Grandfather Edward James. Elizabeth and Catherine arrived in Australia at Williamstown in 1888 from Wales. During the War the property at Diamond Creek was burnt out by a Bushfire in 1942, so, after his discharge he was unable to go back there, so, he bought a property at Springvale Road, Springvale, Victoria and commenced a Poultry Farm. When Mum and Dad lived at Koyuga, Uncle Bal, came up there for a Holiday dressed in his Navel Uniform. We were very excited to see him because my parents did not know he was coming, and when he stepped off the Train and we recognized him, we thought all our Christmas’s had come at once..
Betty and I used to have holidays with Uncle Bal when we were living at Bendigo, we were teenagers then, and we used to travel down by Train, he would meet us at Spencer St Station. Sometimes he would take us to the “Edithvale Beach”, where we spent many happy hours with our loving Uncle. I remember when we were visiting him at the Poultry Farm there was a lovely big tree in his front Garden and Auntie Ruby would make a Picnic for us all and we would go out there and enjoy a lovely lunch and lots of Lemonade to drink. We would also collect the eggs for him as well as wash them because the next morning a man would come and buy the eggs from Uncle Bal. So, the years went by and my parents lost touch with him, but when my husband and I married (Vittorio Zuccato) we visited him once in 1957 at the Poultry Farm and that was the last time I saw him. My husband, Vittorio used to visit the Farm when he was working for the Government as a Construction Builder, building “The Enterprise Flats” at Springvale for the Migrants. Soon after I finished work in 1986 I started to make enquiries about Uncle Bal and found out that he had died on 21/11/1975. He is buried at the “Springvale Crematorium”.